David Dimbleby and Sophie Raworth present as Her Majesty the Queen leads the nation's Remembrance Sunday commemorations from the Cenotaph in Whitehall. Good morning from the heart of London on a bright, sunny morning. square tower. Across to Westminster Abbey on the left of the picture. descendants of people killed in World War One and World War Two. headquarters of the British and Commonwealth forces fighting there. to remember the 446 killed here in the last 11 years. intensely personal and emotional event to take place in Afghanistan. up at 7.00am, people were coming out to be a part of this amazing event. Anderson, received the Victoria Cross for what he did on that day. of the family, Teddie. Charlie was the first of the boys to go to war. He was the second youngest and he was actually a professional soldier. Generally, there was to begin with an eagerness about going to war. Marine, and then a detachment from the Royal Navy itself. and the Normandy invasion, John Brunel-Cohen. it is far more important to get a move on and get their, underlined. On D-day, what were the conditions like on the cross in itself? difficult to march to two bands at the same time. is parading today. Now the Skye Boat Song. Sunday a year ago. Next, the unchanged order of music. The Massed Bands play Edward Elgar's Enigma variations, Nimrod. risked his life going into no man's land to comfort wounded soldiers. and after the War, wrote If Ye Forget. Let me forget! Let me forget! I am weary of remembrance. And my brow is ever wet. With tears of my remembrance. With the tears and bloody sweat. Let me forget. If ye forget - if ye forget. Then your children must remember. And their brow be ever wet. With the tears of their remembrance. With the tears and bloody sweat. leads the Children and Gentlemen of the Chapel Royal on to Whitehall. Tony Blair, and Gordon Brown are expected. Prime Minister. The Leader of the Opposition, Ed Miliband. Orthodox Church are all there. There's the line of the politicians. Mayor of London in the third row behind him. all the armed forces, lays the first wreath. uniform of an honorary colonel of the Royal Wessex Yeomanry. back onto Horse Guards, and are organised by the Princess Royal. world to remember all those who died. Minister, David Cameron, lays the first wreath. Opposition, the leader of the Labour Party. Juniper and Sage, made up specially in Kew. South Africa, India, Pakistan, Sri Lanka, Ghana and Malaysia. 14,000 Canadian troops. The New Zealanders served in World War I.
Trinidad and Tobago, Uganda, Kenya and allowing. -- mill our way. Botswana, Lesotho, Barbados and Mauritius. members of the British Empire, seen almost as a family of nations. Mr Derek K Smith. And Tom Winsor, the Chief Inspector of Constabulary. mankind. Through Jesus Christ our Lord, Amen. # O God Our Help in ages past. # Our hope for years to come. # Our shelter from the stormy blast. # And our eternal home. Sufficient is thine arm alone. # And our defence is sure. From everlasting thou art God. # To endless years the same. # A thousand ages in thy sight. # Are like an evening gone. # Short as the watch that ends the night. last. # And our eternal home. To give and not to count the cost. To fight and not to heed the wounds. reward, Save that of knowing that we will do thy will. Through Jesus Christ our Lord, Amen. Our Father. Who art in Heaven. Hallow'd be thy Name. against us. And lead us not into temptation. But deliver us from evil. For Thine is the kingdom. The power and the glory. For ever and ever. TRUMPETS PLAY # God save our gracious Queen. # Long live our noble Queen. # God save the Queen. # Send her victorious. # Happy and glorious. # Long to reign over us. # God save the Queen. into the Foreign and Commonwealth Office. 1,000 years. Now the politicians who are here. before the march-past begins, let's re-join Sophie Raworth. ago in an incident which left you without your sight. What happened? the march-past. Thank you for joining us. duties - women like Eileen Younghusband. Clerk's Special Duties." She nearly hit the ceiling. She was so amazed. eight hour watch and you were working constantly all the time. silence. They now cheer the veterans as they go past. soldiers were killed during the Troubles in Northern Ireland. The FSA -- SSA FA, who helped people every year. Jewish Ex-service men and Women. 2500 of them were killed fighting. with paralysed veterans in North America with the wheelchair games. Garter Homes, they care for people who have been seriously injured. Association I hear. -- are here. They served in the Fleet Air Arm. Cenotaph. What have you made of it? The two-minute silence was amazing. then other than the leaves in the background. It was amazing. Humbling. Hugely humbling. Now there is a palpable change in atmosphere. were able to rescue people from HMS Coventry when it was bombed. were killed and 1000 were taken prisoner of war. Veterans and the Malaya and Borneo Veterans' Association. armourer during the retaking of Burma. the Green Howards, the Cheshire Regiment, the Mercian Regiment. operations continually since they were formed in 2007.
back from Afghanistan in 2011. Formed in 1940 by Winston Churchill. Princess of Wales's Royal Regiment. Let's re-join Sophie. over the years, the support you are seeing today? In general life, yes. privileged to have been here today. For now, thank you. Arborfield, too, the Women's Royal Army Corps Association. enemy in front." The Reconsaps DELWORD -- Reconnaissance Corps. Veterinary Corps - they are all here. new memorial, the bomber command Memorial, in Green Park was opened. The attrition rate of Bomber Command was enormous. Most of them died. there spent 25 years on high-speed launches. Force from Staffordshire and the West Midlands. round to Horse Guards where we rejoin Sophie Rayworth. are doing an expedition to the South Pole leaving at the end of the week. is about being able to have met him. Amazing. Thank you. President of the British Legion is on the podium with her. their sacrifice. Let's re-join Sophie again. Rifles. We have had 62 killed in action since the Rifles were formed. forever. The average age of our seriously wounded is 18 to 26.
silence once a year seems so little to offer for everything they gave. 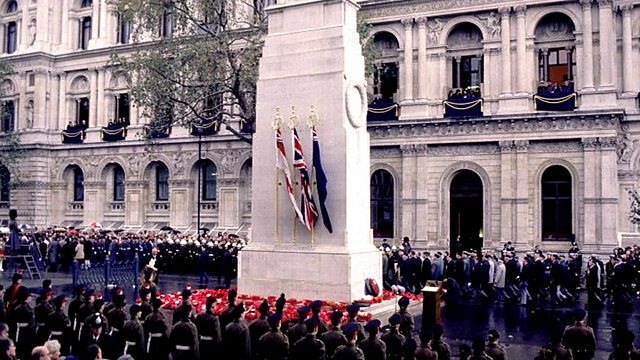 David Dimbleby and Sophie Raworth present as Her Majesty the Queen leads the nation's Remembrance Sunday commemorations from the Cenotaph in Whitehall. The prime minister, leading politicians, representatives of many of the world's religions, dignitaries from around the Commonwealth and military leaders join thousands of veterans from countless conflicts for the two minute silence, service and march past. All gather to remember those men and women who have died in action serving their country.